North Ayrshire Penguins v Murrayfield Juniors U12’s. The Penguins and sitting 2nd in the league and are are desperate to keep that almost unbeaten record with another win over Murrayfield. Both teams came out fighting hard but it was Captain Flynn Massie who starting the scoring after only 1.39 seconds with a breakaway goal, this was followed by 2 mins later when Lennon Deeney found the back of the net before Murrayfield got a power play goal. 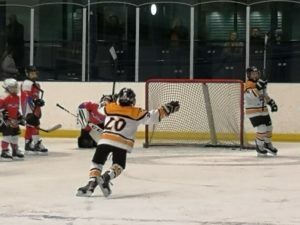 It was the turn of Emma Lamberton to tap in a lovely pass to score her 1st goal of the match before Lennon scored another making it 5 – 1 to the Penguins at the end of the 1st. The next period saw more of the same, with both teams fighting to score, it saw them both up their game play with passing really coming into the game for the Penguins, thus seeing more goals from throughout the team bringing the 2nd period to a 10-2 finish. Although many would expect the Penguins to take their foot of the gas with an 8 goal lead, Murrayfield came out fighting, so after Penguins Jacob Woods (A) fired in a goal after 25 seconds Murrayfield tensions rose and unfortunately found themselves a man down on and off for the rest of the period. 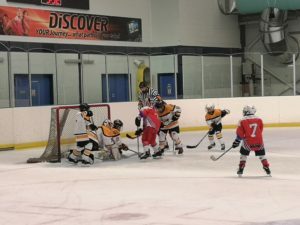 Penguins took full advantage to increase their score by 9, but Murrayfield kept fighting and managed to score another 2 goals. The Stars were looking to carry on the good fortune of the Penguins but fell foul to a boarding penalty but instead of playing defensive, it was Dylan Murray who pressed forward scoring a short handed goal with little over 6 minutes on the clock and then again with another 2 quick goals before Murrayfield got anywhere near our goal. It then went from end to end with Josh Carslaw getting 2 while Murrayfield fought hard and scored 3 goals while displaying some fine hockey before the period finished 5 – 4. The next 2 periods were close but it was some youngsters gaining valuable experience with the Stars who followed in the footsteps of the Captain Jack Neil to score another 2 goals and showing they are growing as a team when they came out the worthy winners. Final Score: North Ayrshire Stars 8 v 5 Murrayfield Juniors U14. Man of the Match: Fraser Maloney. Goals from: 3 x Dylan Murray(A), 2 x Josh Carslaw(A) and 1 each from Jack Neil (C), Jacob Wood, Adam Bainbridge (Scoring his 1st Stars goal). 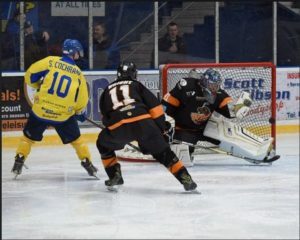 Wild travelled through to Kirkcaldy for the first leg quarter final play off place. The Wild were without a few players but that didn’t hold them back and they matched the skill of the Kirkcaldy team up until they took a penalty and Kirkcaldy used this and scored their 1st goal, it wasn’t long before we took another penalty & again, Kirkcaldy took advantage yet again, unfortunately, the guys heads went down and Kirkcaldy applied more pressure the period ended 5-1 with Adam Kerr getting a goal back for the Wild. Second period was a far better period for the Wild with end to end play from both teams and The Wild putting up a great fight on what Kirkcaldy thought would be an easy ride. The period ended 6-2. Into the 3rd and it went from end to end again, this was a great game to watch and credit to the refs and linesmen, with great decisions, equal to both sides. 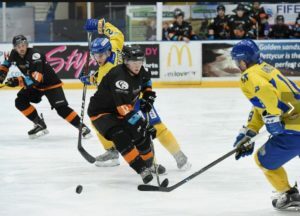 This period found Wild constantly in front of the Kirkcaldy net looking for tip ins but it wasn’t to be the comeback they wanted with both teams looking tired , as it should be as this was a great game of hockey to watch. Return Leg of this Play-off game being held at Auchenharvie Ice Rink, Stevenston on Sunday 24th March with Face Off at 6pm.